I must confess that I literally lived in my cookie boxes the past weekend but – at least for today – I will take a sweet break (as much as I love them). My body needs something light and healthy, a salad. 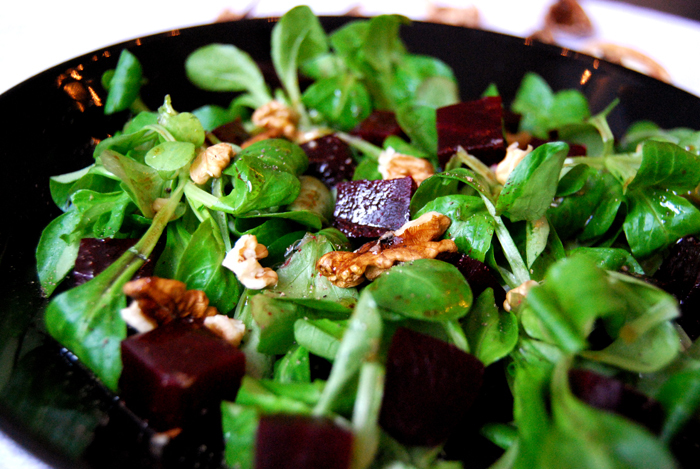 In winter I love to get boxes of organic field salad, its nutty taste is great to combine with roots, fruit and nuts. You just need to throw a handful of these little leaves in a bowl, add whatever you feel like and drizzle some olive oil and balsamico on top. It makes a great lunch or dinner even with some cheese and bread on the side. 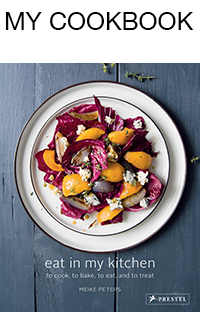 As this salad is so easy to prepare and looks and tastes so good, it is also a very nice starter for a wintery dinner party. Sometimes I arrange this lettuce with mango or apple slices but my favourite combination is cooked beetroot and walnuts. I cooked a few beetroots a couple days ago and still have some left. 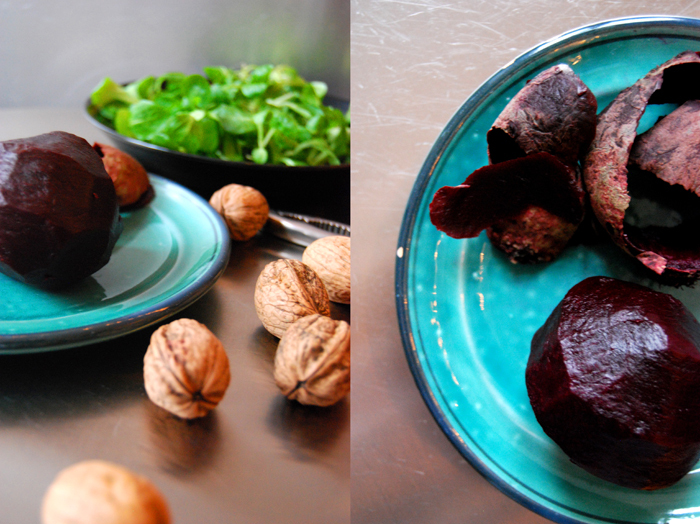 I chop up one medium sized beet in little cubes and mix it with two handful of field salad. My dressing is simple but matches the beetroot perfectly: 3 tablespoons of olive oil mixed with 2 tablespoons of balsamico, seasoned with salt and pepper, that’s all it needs. I pour the thick dressing on top of the salad and drizzle 5 chopped walnuts on top. Today there are two of us enjoying this tasty and healthy treat! We eat beetroot quite often, I buy 3 or 4 of them every week and cook them with 2 bay leaves in salted water for 45 minutes (more or less depending on their size). This way they keep their strong and unique taste. I love them sliced thinly as a carpaccio or cut into cubes in wintery salads.